Non Irritating for soothing dry, itchy skin. Especially good for skins prone to eczema, psoriasis and dermatitis. Ideal for sensitive skin, the proteins in Goats Milk kill acne producing bacteria make it an ideal choice for teens or those with acne prone skin. Many goats milk soaps and body washes use powdered goats milk. 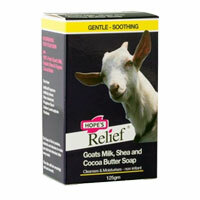 Hope’s Relief Goats Milk bodywash uses 100% fresh goats milk.